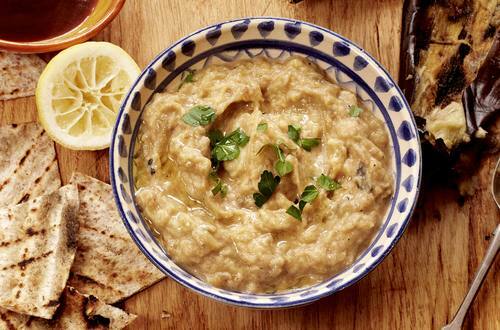 Inspired by our visit to Berber & Q, our Twisted Baba Ganoush takes a Middle Eastern classic & gives it an American Twang. 1 Place the 2 aubergines straight on hot coals and the bulb of garlic indirectly on the grill for 30 mins until smoky and tender. 2 Mash up the flesh of the aubergines, four cloves of the smoked garlic, lemon juice, salt and pepper and 4 tbsp Hellmann’s American BBQ sauce.